Rugged and simple with industry-leading flight time. Lynx is a hand-launched drone for precision agriculture and surveying. Featuring a three hour flight time, Lynx is perfect for covering large areas without sacrificing resolution. The aircraft is simple to use, and its Kevlar construction is extremely durable. Flights from confined areas are possible due to its hand-launch takeoff and steep deep-stall landing. 6.0 sq km (1500 acres) at 2.34 cm/px flying at 120 m AGL (400 ft) with 24 MP payload. Lynx was designed from the ground up to be a mapping drone and to withstand the abuse that comes with working in the field. Lynx is mechanically simple with only three moving parts, and the aircraft itself is extremely durable thanks to its composite Kevlar construction. This makes Lynx one of the most durable drones around. Leave your grassy field at home. Lynx is able to be flown from confined areas due to its hand-launch takeoff and steep deep-stall landing. Hold the plane and press a button to takeoff and let the autopilot land within meters of your chosen landing spot. No unnecessary gear. The takeoff method and deep-stall are versatile, simple and do not require any additional equipment onboard or on the ground. The aircraft features a clip-on tail and removable three-piece wing for easy transport and rapid assembly. The entire system packs down into one carry-on size case and one airline checkable case. Achieve centimeter level accuracy with post-processed kinematics PPK GNSS or choose to activate PPK later, if needed, without any hardware changes to the aircraft. Swift GCS is how you pre-plan and control Lynx in flight. It features a sleek and simple touch screen interface that is ideally suited for field tablets, and requires minimal computing hardware to run. New users are guided through the flying process via the built-in checklist and preflight steps. Survey planning is fully integrated with intuitive controls and drag and drop waypoints. A modular payload bay sits beneath the wing allowing users to fly the right camera for the job. Three camera options are currently offered with custom payloads available upon request. 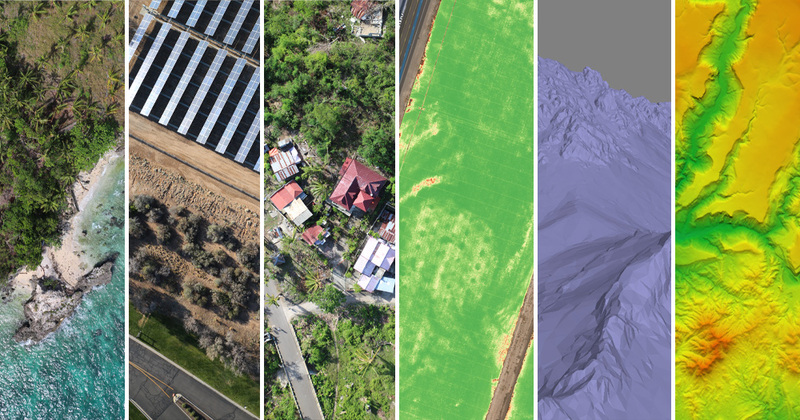 Photos captured by Lynx create a wide range of GIS content, including: point clouds, orthomosaics, digital surface and elevation models, and textured models. This data is used for elevation maps, isolines, planimetrics, water flow analysis, simulations, augmented reality, and crops health monitoring. Geo-referenced imagery from Lynx is compatible with standard photogrammetric software such as Photoscan. The Lynx case is airline checkable and fits in the trunk of a car. The flight batteries are non-dangerous goods (DG) and can be shipped worldwide with greater ease than batteries required by multicopters or larger systems. Contact support@srp.aero for pricing and more information.